Another recap/update this week as I have been so tired but I am going easy on myself as the weeks edge nearer to D-day and just keeping up with this project of mine at all, makes me happy. 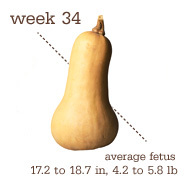 – Week 34 was the size of a Butternut Squash – very seasonal ! 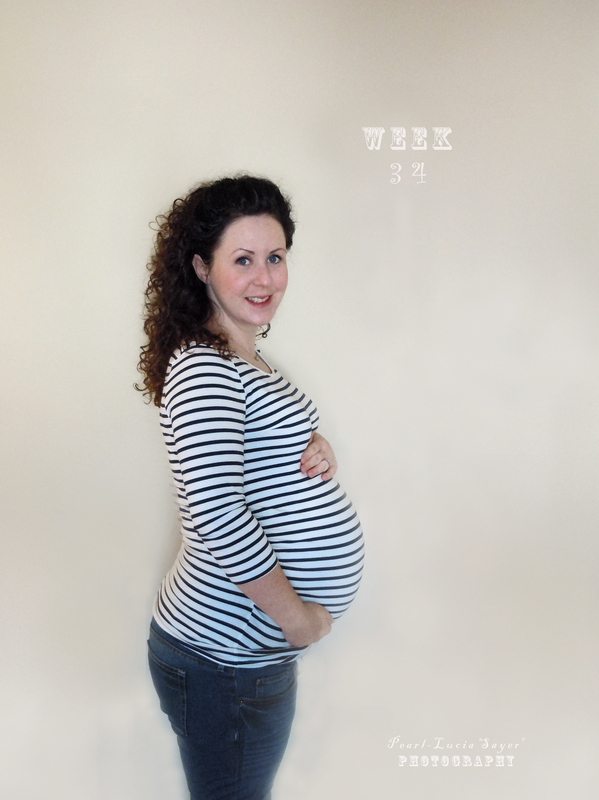 Baby is still getting fatter – I can feel heavier each week that passes and slower! Sometimes when I catch sight of my own reflection in a shop window I am surprised at how much larger bump looks and even though I don’t forget I am pregnant it’s still a shock for a split second ^_^ This past week I was able to breathe slightly easier again but trips to the loo have increased due to pressure which means baby has begun it’s descent lower into my pelvis. Speaking of trips to the loo, baby is now passing up to a pint of urine daily! That extra pressure ‘down there’ has added to the attractive pregnancy waddle and some days can feel very uncomfortable and pinchy.It’s a hard one to describe! All the reading sources say that baby can recognise simple songs I am singing to him/her which is endearing. I like the idea of our baby being born with a familiarity of musicals, traditional folk ballads and Indie rock! Back aches, Oedema,Braxton Hicks and fatigue are the main complaints I have now, sometimes all at once, and will probably continue to have until D-day. Shoes/boots are a no-no, and I can just about manage to wear my chucks on the cooler days (every other day it’s flip-flops – thank goodness I am in a climate that allows summery footwear I must say!) really loose and only if Robin ties my laces for me. I tried one day to do them by myself and after much huffing, puffing and straining followed by being nearly close to tears I gave in and called himself to take over. All in all though, this last trimester is going really well for me. It is hard to believe the end is nigh! This has been the fasted 8 months of my life. 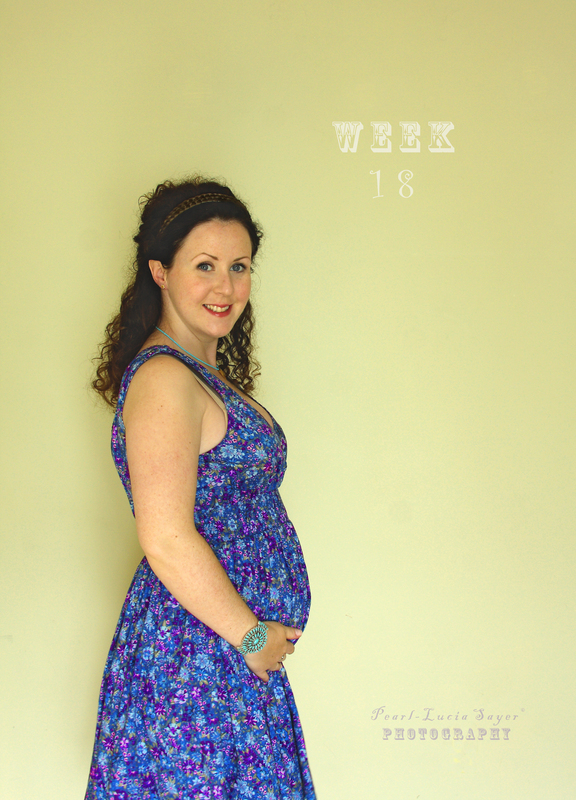 Over the past few months, thoughts on pregnancy in general have popped into my head randomly – nothing unusual about a pregnant lady thinking of pregnancy, I know! But I really am loving the whole experience and thankful for it too. 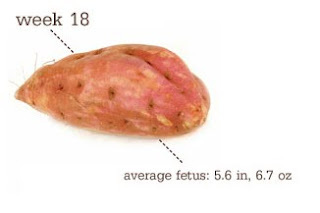 I think I may even miss being pregnant once it’s all over. Nature is mind blowing and this reminds me of how much so, daily. To be able to grow another person and go through so many physical and emotional changes in a reasonably short space of time, is in itself mind blowing! I can understand the whole ‘miracle’ references now. I suppose it feels like that in a sense, especially the end result – a healthy baby, another person who is an extension of both of you.. Maybe this is just the hormones talking, but hey I’m allowed to sound a little bit high on life I reckon. I have many sleepless nights and my mind is in over-drive but I feel happy and excitment is building now for both of us! We can’t wait to finally meet our baby and know if it’s a boy or a girl. Gender guessing continues especially from strangers. Even the barista guy in my local Starbucks had his guess this week too – he reckons it’s a boy as I am looking more ”round” now. His words, not mine.